The 9th edition of annual Vijay Awards 2015 held yesterday (April 25th) at Jawaharlal Nehru Indoor Stadium in Chennai. The event is attended by who’s who of the industry. Yesterday, winners list was leaked. Now, it seems that the leaked winners list was not correct. Actresses Tamanna, Shruti Haasan, Prabhu Deva, Pooja Kumar, Hip Hop Tamizha performed Live on stage and their performances are highlight of the event. We heard that the jury of the 9th Annual Vijay Awards have chosen the best from 150 nominations for thirty different categories. 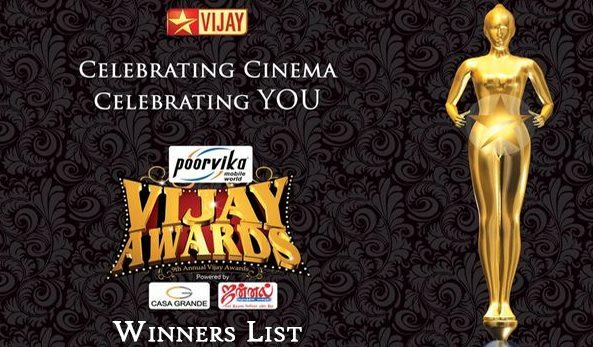 Here is the Vijay Awards 2015 final winners list.